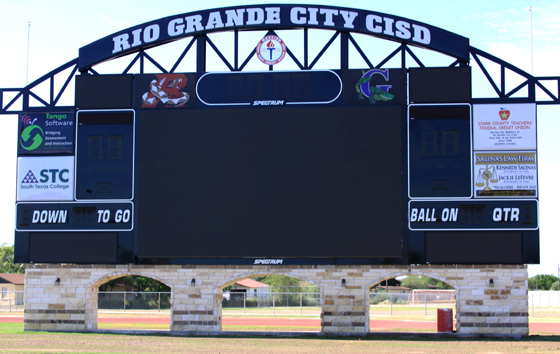 The Rio Grande City CISD Athletic Department is thrilled to announce that they have installed a new state of the art scoreboard at Joe R. Sanchez stadium. The district along with the Athletic Department worked diligently in order to assure that the installation was completed before the new football season. This new scoreboard is not only the largest in Rio Grande Valley but also the third largest in Texas measuring 73 feet wide and 42 feet tall and has several spaces for advertising for any interested business. The scoreboard also features a digital screen that will allow for instant replays and to feature commercials. The four full color ad displays for advertisements (2-6x8 and 2- 4x12) are located on the sides and lower part of the digital screen. The proceeds collected from the sponsorships will generate the revenue to pay all expenses of the scoreboard. If there is any business that is interested in advertising during the football games this is your opportunity to participate. We thank our sponsors in advance for their commitment to the Rio Grande City CISD! Come out to the Joe R. Sanchez stadium during the 2012-2013 football season to support the Rio Rattlers and the Grulla Gators at all of the home games. Season tickets go on sale August 6 through August 10 at the Athletic Department. Tickets that are not picked up before 3:00 p.m. on August 10, 2012 will become available for sale to the general public on Monday, August 13, 2012. For more information on advertising or game tickets contact the Athletic Department at (956) 716-6720.